Co-sponsored by Belk Library & Information Commons, iPALS, and OIED. Part of International Education Week. The first Iranian Vampire Western ever made, Ana Lily Amipour's debut basks in the sheer pleasure of pulp. A joyful mash-up of genre, archetype, and iconography, its prolific influences span spaghetti westerns, graphic novels, horror films, and the Iranian New Wave. 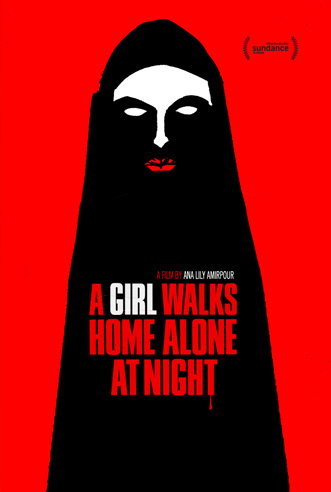 "Yet even as Ms. Amirpour draws heavily from various bodies of work with vampirelike hunger, she gives her influences new life by channeling them through other cultural forms, including her chador-cloaked vampire. The Girl isn’t actually alone: She has lots and lots of company." "Ianian-American writer-director Ana Lily Amirpour describes her weirdly exhilarating feature debut, which premiered at Sundance last year, as the Iranian love-child of Sergio Leone and David Lynch, with Nosferatu as a babysitter. It is set in the fictional Iranian ghost town of Bad City (the name nods toward Frank Miller’s Sin City) and plays out like the missing link between Kathryn Bigelow’s first two features; the ultra-cool biker pastiche The Loveless and the latter day vampire flick Near Dark."